The only way this can be explained is a miracle! I finished a quilt top in less than a week! I started last Friday and was finished this afternoon. It was decided sometime over the past weekend that this would become Adam's new quilt. Now it has turned into a whole huge project with paint being chosen and purchased from Lowe's ( Gravity is the color), new sheets from Target and a fish tank! The fish will not happen until the room is completely cleaned. Bribery is sometimes the best choice. Adam had a say in what the final design. He preferred the neutrals in the center stating that he liked how it showed more detail :O) He also chose the Kona cotton dark blue when given the choices of snow, ash or the dark blue. He made an excellent choice! Most important, he is very pleased with his new quilt. Now I am hoping for another miracle in getting the quilting done! Beautiful! I love the design and the colors used...very modern with a classic block. Fun! Such a cool quilt! Adam is one lucky guy! 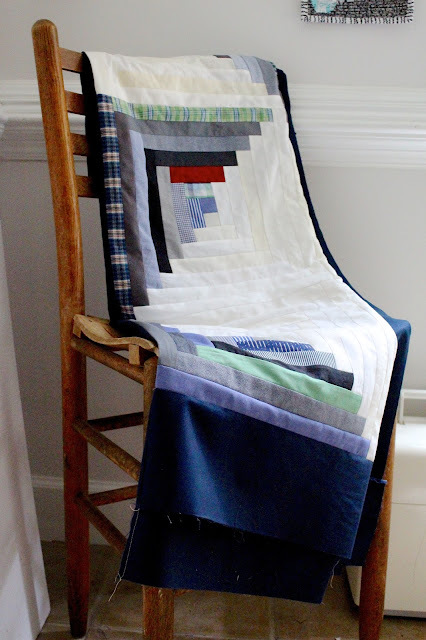 Got to love a log cabin quilt. 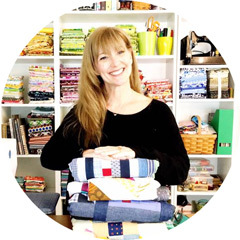 That looks wonderful, Happy Quilting!